Kotaku 'Shop Contest: A New Ken! Read the name of this week’s Photoshop contest in a firm, gruff voice. Put a little anger into it. Now cup your hands together at the palms, pushing away from yourself. We’re not responsible for any fire damage you incur. Earlier this week Capcom revealed a new look for one of Street Fighter’s most iconic characters, Red And Blond Ryu. I kid the fighting game fans, I realize the two characters play quite differently and have for ages. It was just their looks that were a bit too similar, so Capcom took steps to change that. Steps involving clay bananas, apparently. Some say Capcom can do better. I think you guys can do better. I know you can. Possibly. Maybe. 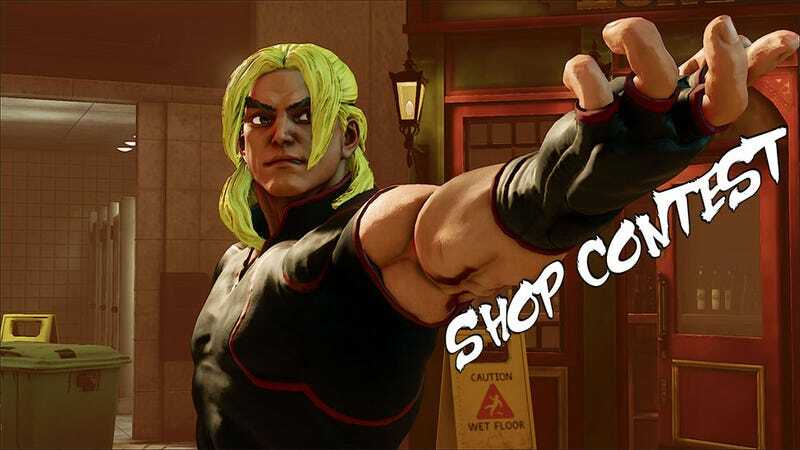 So grab your favorite picture of classic Ken Masters and give him a makeover. Or grab one of the new Street Fighter V screens and try to make them look less like bad 3D printing. Your choice! Then join us next Saturday, when we reveal Ken’s new new look. 1. Create your ‘Shop and save it to your desktop. Images must be at least 636 pixels wide. If they aren’t, you will be playfully spanked.